A recent statement from CMT (Compagnie Mauricienne de Textile) and the situation at Palmar Ltée has created an upheaval. While Palmar Ltée has gone under receivership, the direction of CMT announced that it is looking at the possibility of relocating part of its operation towards Mozambique, meaning the elimination of 5,000 jobs. Loss of jobs, cry of despair and economic burden are on the agenda. Is our textile industry on the verge of a big crisis? Ever since the Tourism Authority brought about new regulations for pleasure craft operators, many of them, especially in the Eastern part of the island, are at loggerheads with the authorities. They claim they are being unduly harassed but the authorities maintain that they are only enforcing the law to ensure full compliance. So how did it all start and what do boaters want? More than 40% of the total investments from Mauritius into Africa are directed towards countries with which Mauritius does not have a tax treaty, says CEO of KATIC Consulting and former director of Bank of Mauritius (Development and Supervision of Financial Markets & Internal Debt Management Dr. Chiragra Chakrabarty. In this interview, the PhD holder in Economics points out that Mauritius has all the potential to become one of the best International Financial Centres. 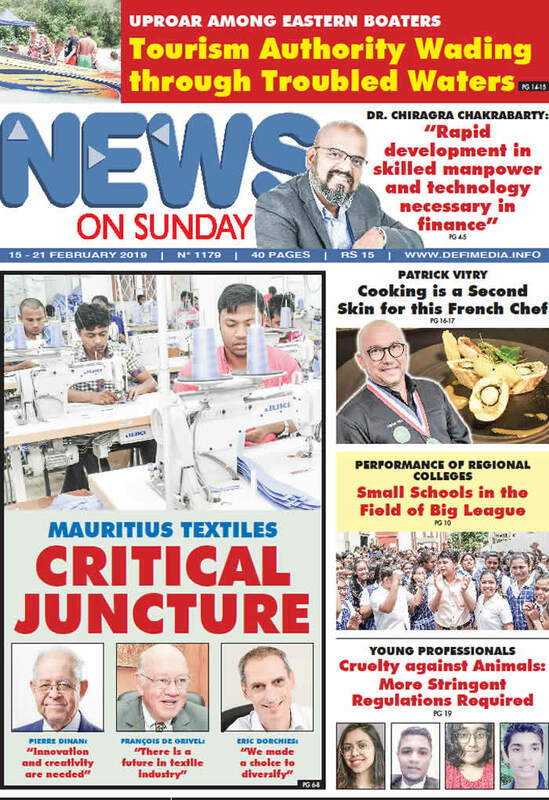 Transmitting his ‘savoir faire’ and his passion for cooking: This is the aim of French chef Patrick Vitry who has settled down in Mauritius since 1999. Consultant and trainer at the Atelier des Sens Co. Ltd, the Chef shares with us his successful pathway and why he trusts we should encourage our youth to embrace vocational careers. Regional colleges standout year by year with their performance at Higher School Certificate (HSC) level. Besides producing laureates, regional colleges around the island are distinguishing themselves by having many students ranked in the scholarship list after the laureates. Should we expect more from these colleges in the future? Charles Darwin, in his book “Origin of Species,” extolled the intelligence of animals, for instance how dogs or monkeys turn very territorial to protect themselves from external attacks. That’s nature’s laws. When it comes to humans and society, animals are dismissed as insignificant creatures.